Curved tempered tilt-out front glass for easy cleaning. Removable sliding rear doors with moisture vents. The moisture vents and a forced air front-glass defogger prevent excess moisture buildup. UL Safety and Sanitation Listed. Heating wells are one-piece stainless steel. Each well is heated with its own cal-rod heating element and is controlled by its own thermostat. Each well has a drain and valve. 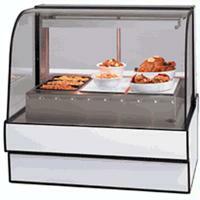 Top-mounted, full-length infrared heater provides uniform product temperature. Incandescent lighting provides even product illumination. Each well holds a full-size pan.